A few unexpected surprises that thrilled us so last month and brought joy to our hearts! with vibrant scarlet-coloured or reddish-orange flowers bloomed for the second time, about 2¼ years after the first flowering in April 2010. Seriously, we had wanted to thrash it but before removing it, I decided to cut off their foliage early July to see what would happen. When some new leaves emerged, a flowering stalk soon followed. How wonderful!! The large flowers are 13 cm in width on a flowering spike of 47 cm tall. Even though it had only two flowers, it was amazing to watch it unfurled, from a bud to its glorious beauty! a self-sown seedling that was repotted late last year, started to flower when it was just about 76 cm (2½-3 ft) tall. Amazing that it’s blooming at such a tender age! 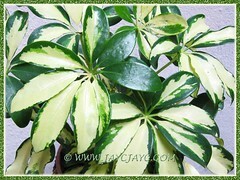 This gorgeous variegated foliage plant that has palmately compound leaves in green and usually mottled creamy-white or lime-white had been our target for a couple of years, but was avoided as most of the garden nurseries would rather promote their mature plants for RM40.00 or more. Fortunately we chanced up it and bought for only RM8.00. 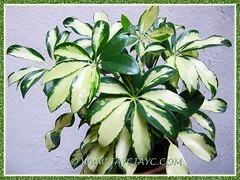 We prefer young plants that can fascinate us as they mature into their teens and adulthood, with our tender loving care. 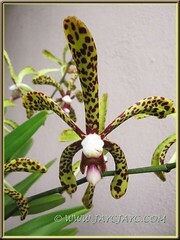 Leopard Orchid (Ansellia africana) with variable size and color. Hope the ID is correct? Update March 12 2013 – Thanks to James for ID help. This orchid’s botanical name is Aranda ‘Bertha Braga’ (Parents: Vanda tricolor x Arachnis ‘Maggie Oei’). I fell head-over-heels with it the minute I saw it among the other orchids that were on sale. 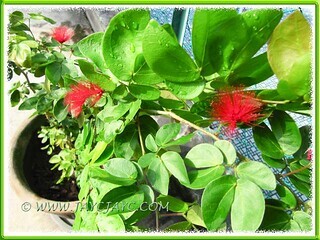 It was sold at a promotional price of only RM15.00, with a discount of RM5.00 and the pot had two plants with three flowering stalks. The flowers are truly eye-catchy, yellow and brown-spotted, leopard-like! Besides, it exudes a lovely fragrance too! Wow!… isn’t that wonderful? My beloved John didn’t hesitate to purchase it, seeing my yearning gaze and fascination towards this beauty. 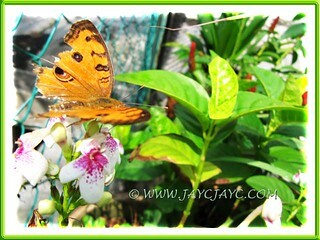 A very frequent visitor to our tropical garden that seems to be attracted to the many flowering plants therein. Poor dear, looking at the image on the left, it appeared that its impressive dress had been tattered and worn out. Probably, an oldie but flying and fluttering around our garden like a teenager! Amazing… nature spins its wonders and we get to enjoy them, photograph and share them online. Praise and thank The Lord for His wonderful creations. How blessed, grateful and joyful we feel to be able to encounter them everyday! Life is beautiful, right? 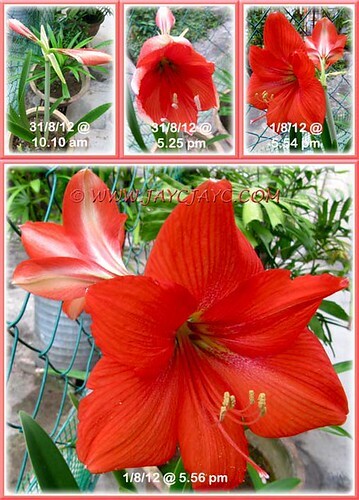 Very beautiful Hippeastrum flower, plants are pruned thank you from time to time to present their beauty: flowers. You have spectacular flowers and orchids. Thanks for showing them. Praveen… thank you for your lovely comment! I was admiring at the orchid plant you got but I doubt it is a Leopard Orchid as those are from the Grammatophyllum genes species – very much as the same as the Giant Orchid. here – pretty sure it look almost alike. These are quite hardy & so I doubt you really have to worry much about them. Oh James, you’re such a helpful and informative blogger friend. 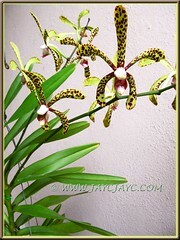 I truly appreciate your search for my orchid ID and giving the link to it. My orchid flowers do seem similar as displayed. By the way, I wish to apologize for the late response, James. Frankly, I am not so well for sometime now as I’m feeling weaker and weaker, and encountering the adverse effects of the chemotherapy as the chemo sessions increase… thank goodness, there’s another 10 once-a-week session to go, ending end of November. Hence, my online time had been drastically decrease to about 1-2½ hours a day due to my weakness. I know you’d understand my explanation. I am struggling with my hippy lily. It has not flower but it was flowering when I bought it at the nursery 2 years ago. The leaves are always eaten by some pests. 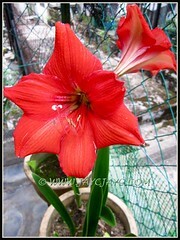 I like the bright red colour of your lily. The orchid is a good find. I am also with you when it comes to buying plants from nurseries. Seeing a young plant grow to maturity under your own hands is very satisfying indeed. Jacqueline, I hope you are feeling much better now, brave lady. And getting enough rest, relaxation and gaining more physical strength. Take care yeah. Lovely to get a visit from you, A.Belle! Our hippie too had not flowered since April 2010 until I cut off its leaves and it then decided to bloom. 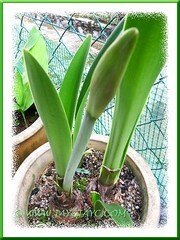 And, we’re delighted that a second blooming stalk emerge from another bulb this month. Thank you so much for your concern and well wishes for my health recovery. Please refer to my reply to James, just above your comment that explains my current situation. God bless you for your kindness, my dear friend.